My salad recipes vary from ones that are quick to rustle up to salads with quite a long list of ingredients. 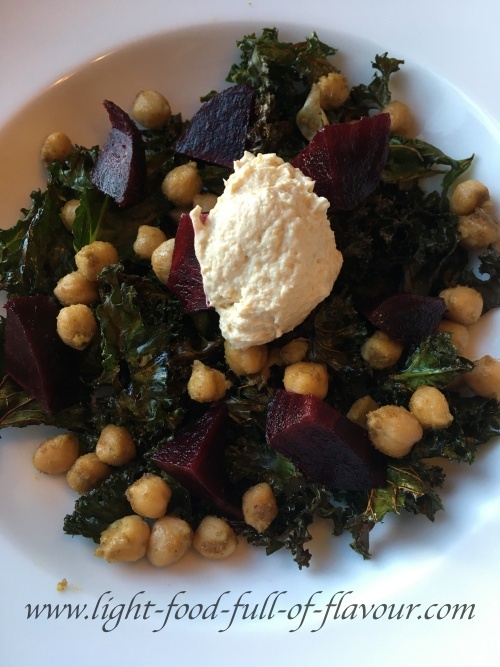 These recipes do not require that you follow them slavishly (not many recipes do) – look upon them only as blueprints and get creative with that salad bowl of yours. 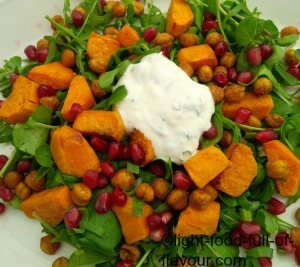 This is a mega tasty and nutritious sweet potato salad which I serve with a garlic and mint yogurt sauce. 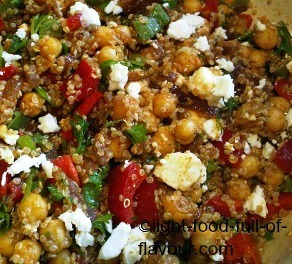 Super-delicious, highly nutritious and filling - this quinoa and chickpea salad is good enough to eat on its own. 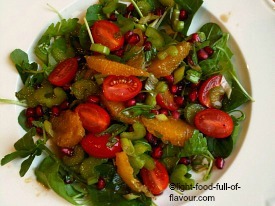 An orange and tomato salad with plenty of zing and a colour palette to please the eye. 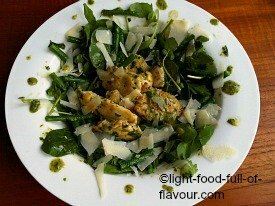 This sensationally tasty warm chicken salad is served with a rocket, parsley and mustard dressing. 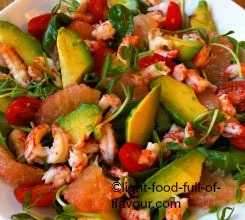 Super-fresh and gloriously tasty - a salad that will blow you away. 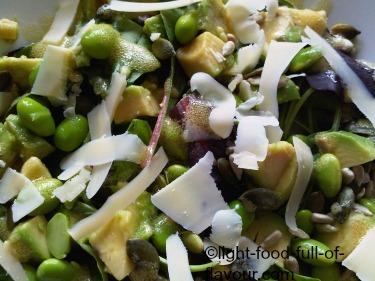 A salad full of beans - a tasty and healthy avocado and broad (fava) bean salad. 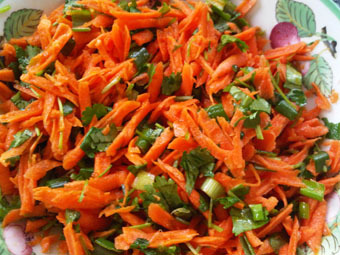 A fantastically fresh-tasting Asian-style carrot salad that is low in calories and goes well with other types of Asian-style food. 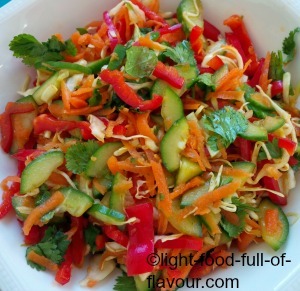 Fresh, full of flavour and living up to its' name - a crunchy Thai salad with lots of attitude and healthy to boot.. I love it! 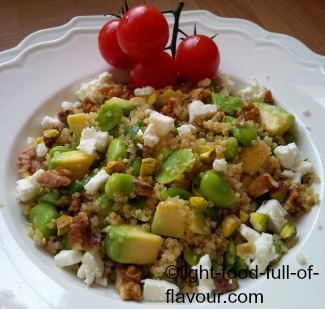 A super-tasty ginger, garlic and citrus-infused quinoa and avocado salad with fava beans. 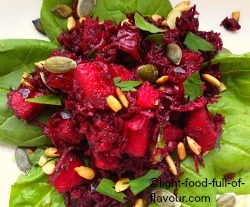 This beetroot and apple salad is juicy and full-flavoured and can be served with fried halloumi. 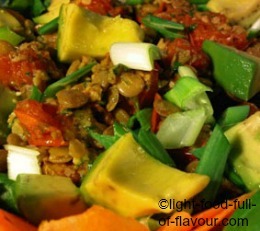 A filling and sensationally tasty Puy lentil salad. 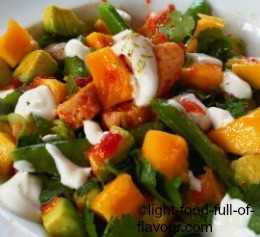 A light, fresh and oh so delicious chicken and mango salad with avocado and sugar snap peas as well. 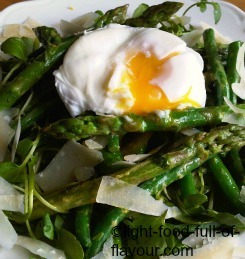 A really light, super-tasty and mega-healthy asparagus salad. 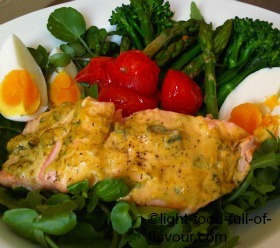 A very tasty, light and healthy mustard marinated salmon salad. 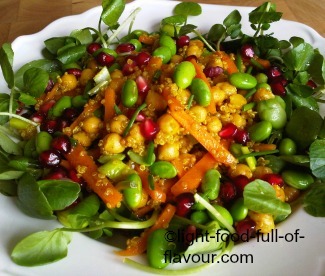 A fantastically tasty, healthy and filling carrot and quinoa salad with chickpeas and soybeans. 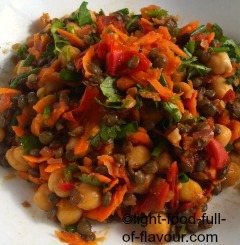 A super-tasty and healthy warm lentil and chickpea salad which is low in calories, bursting with flavour and filling. 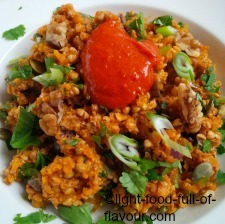 This is such a tasty warm buckwheat and harissa salad with butternut squash, herbs, seeds and nuts in it as well. 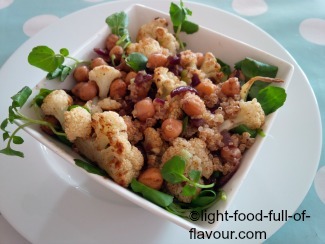 An oven-roasted cauliflower salad with chickpeas and quinoa - spiced with coriander, cumin, allspice and chilli flakes. 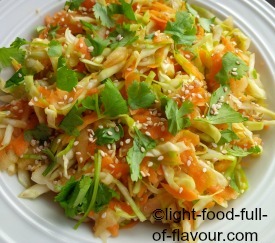 A coleslaw with a difference - an Asian coleslaw which is full of flavour, healthy and low in calories. There are so many wonderful things to pick and mix to make a salad and so many wonderful ways to make a salad dressing to drizzle on top. A lot of the time though, I’m perfectly happy to simply drizzle over nothing else but a little bit of olive oil and a little bit of really decent balsamic vinegar, which can make the most humble vegetable into a superstar. You only need to use a small amount of good balsamic vinegar though as the flavour is so concentrated, making a bottle of the good stuff last longer. 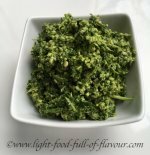 Let me show you some easy ways to add oomph and taste to salads with recipes for three delicious salad dressings.